The 10 Best Tattoo Parlors in Michigan! Committing to get a tattoo is big, so finding the best spot to get it done is imperative. You’ll have plenty of choices across the state of Michigan, with the top-notch spots offering a clean space, expert artistry, and satisfaction guaranteed. Here are the 10 best tattoo parlors in the state. Taylor is home to Babydolls Tattoo, a parlor offering a full range of options for the interested. From the macabre of skulls and chains to the gentle floral beauty of roses, just about everything is on hand here. The parlor's most interesting entry, however, is a 40s-era pinup girl in what appears to be the Vargas style, whose head has been replaced with that of a velociraptor. Marquette's Sacred Tattoo can do some downright impressive work. While it's able to work with a variety of tattoos in a variety of different sizes, its clear winner is a magnificent “chest piece” that features multiple horses inside a frame that looks like a shield. Run by Dan Pemble, Sacred Tattoo can offer a host of other potential pieces, including Japanese, traditional, realist, portrait, or even specific custom jobs. Lansing's Eclectic Art Tattoo is the home of Sean Peters, a man who the Lansing State Journal called “passionate about (his) art.” Having been actively tattooing for nearly 30 years, Peters specializes in “biomechanical designs, abstract designs, surrealism, and bright, colorful stuff.” A man with that level of experience and commitment is tough to come by, and that makes Eclectic Art—which he co-founded with fellow artist Mike Riina in 2010—well worth considering. Three Rivers is home to Hot Rodders Ink, a shop that's struck a chord with locals thanks to its “friendly and always welcoming staff.” That's a great start for any operation, but follow up with their wide range of picture options, their professional nature, and their requirement of picture ID—minors will not be tattooed at Hot Rodders, a point it makes quite clear—it's a safe and welcoming environment that should make for an excellent experience for customers. Head on up to Greenville to check out Bold Statement Tattoos and Piercing Emporium, a shop whose name says it all. Home of piercings and tattoos but also tattoos of a nature that makes these bold statements, each and every one. Some of the detail on these is amazing, from a half-sleeve of roses to a picture of a tree at sunset using the entire state of Michigan as a frame, the end result is some truly bold statements for the potential customer. Muskegon's Electric Coil Tattoo and Body Piercing delivers a similar value—thanks to the combined front of tattoo and body piercing—to earlier entries, but also offers a surprising value in its range of work. From some really impressive mermaids to some cartoonish renditions of Death itself, there's just about nothing here that can't be done. Add to that a clearly satisfied customer base—it's got five stars on its Facebook page—and the total experience should be amply worthwhile. Mount Pleasant's Intricate Decor boasts the work of Jason Rhodes, a tattoo artist with a surprising penchant for the panoramic, and the cinematic. A dramatic approach to Star Wars' Cloud City on Bespin, or a complete zombie apocalypse, all of these are available, and impressive, via Rhodes. Rhodes isn't the only one in the shop, though, and those looking for a high-end tattoo will be able to get just what they're after here. Sturgis has more than a few tattoo shops within its boundaries, but one of the clear standouts is Infinity Ink Tattoo. Infinity Ink can do some pretty impressive things—one of its best-known works is an “Alice in Wonderland” image with definite punk sensitivities like an eyebrow piercing. It's got a lot more than that going on, though, as it's done some impressive work with tigers on the sides of people's heads and more. Widely regarded as clean and professional, Infinity Ink is a surprisingly upscale option in a small-town environment. With three locations (Clio, Flint, and Bay City) and a good range of art coverage to its credit—it can handle traditional and non-traditional, along with both American and Japanese traditional material—it's got a lot to offer its customers. One of its best pieces, though, is a wonderful metaphor: the state of Michigan, upper and lower peninsula, with roots growing from the underside of both. Lucky Monkey Tattoo in Ann Arbor has been supplying Wolverines with tattoos for almost 20 years now. Having opened up in 2001, it's actually supplied ink work to some at least minor league celebrities from Supersuckers' Eddie Spaghetti to Red Wings player Darren McCarty. 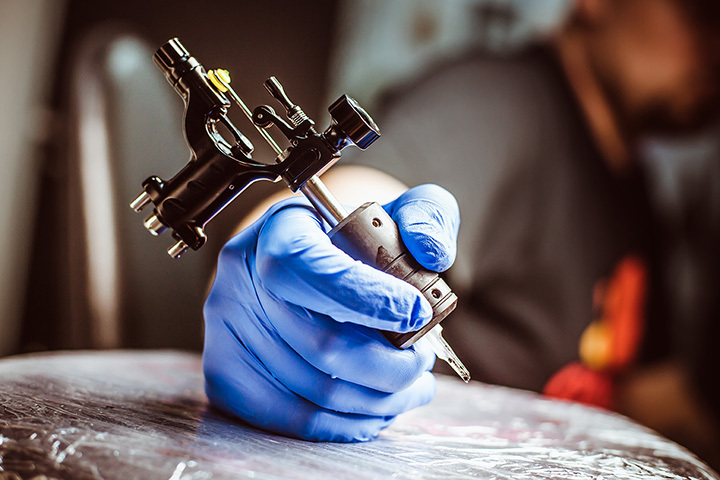 An officially-licensed facility with the Department of Community Health, and recipient of several awards—including Current Magazine's “Best Tattoo Shop” for most of the 2010s and a large part of the late 2000s—Lucky Monkey will deliver ink just how its customers desire.